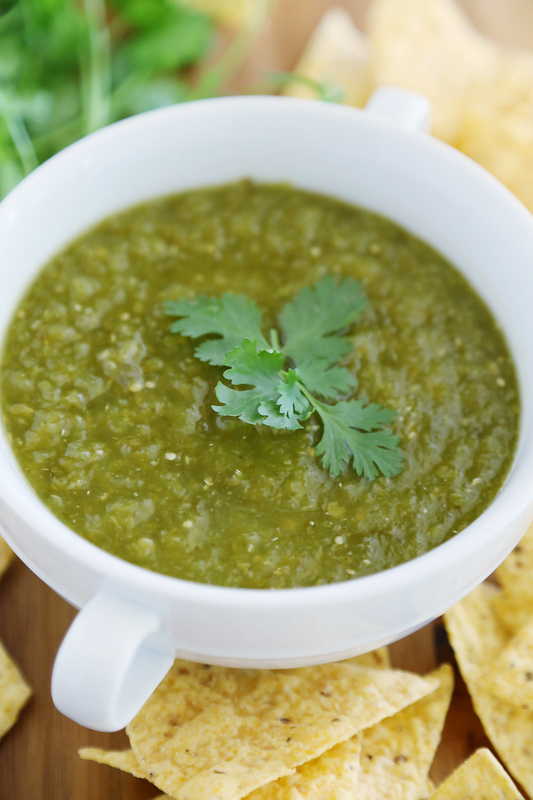 This spicy, tangy salsa with roasted chilies, tomatillos and lime makes a perfect party appetizer! 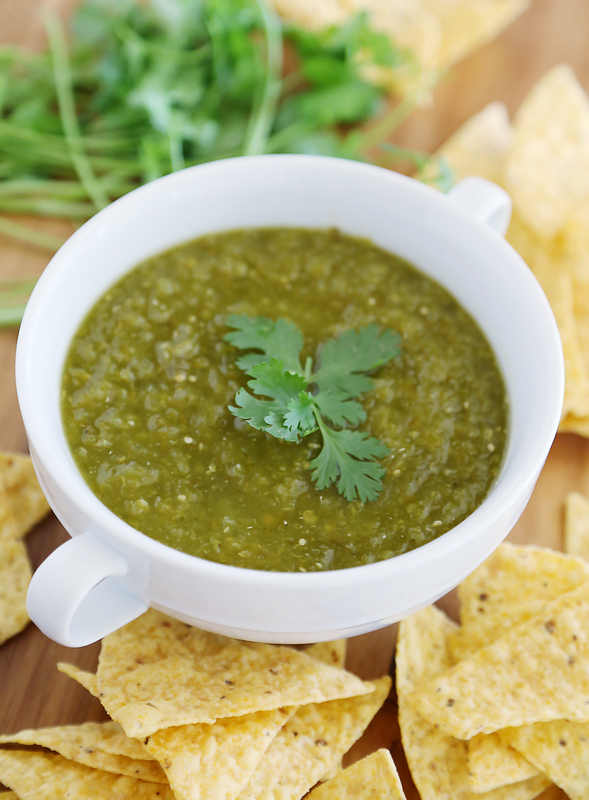 Serve a bowl with tortilla chips, or spoon on top of your favorite Mexican meals to give a kick of zesty flavor. Though there are plenty of just-fine store bought salsas on shelves, none compare to homemade salsas packed with the flavors of fresh, seasonal ingredients. Hatch chilies are a medium-spicy pepper with an aroma similar to onion or garlic, and a subtly sweet and crisp bite. 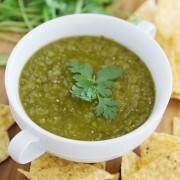 They give off an incredible aroma when roasted, which is just what makes this salsa so scrumptious. 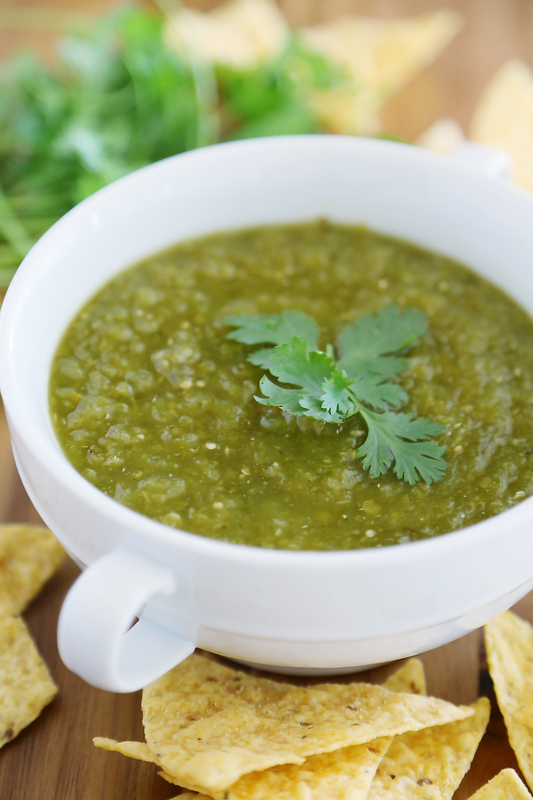 Combined with fresh Serrano chilies, tomatillo, lime and cilantro, it is a vibrant, zesty combination of summer’s best spicy flavors. And it will have you chip-dipping again and again! Preheat oven to 400 degrees. Place halved hatch chiles on a large lined baking sheet. Roast for 30 minutes, or until slightly charred and softened. Let cool slightly, then roughly chop. 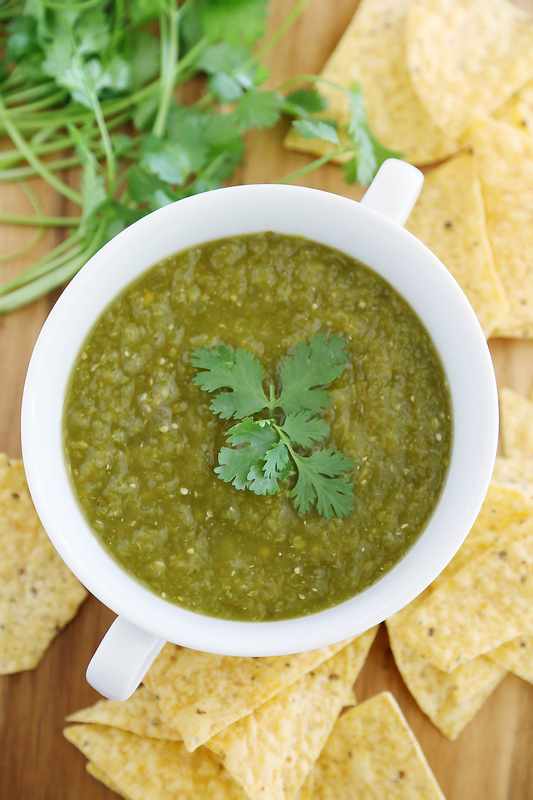 In a large pot, combine all ingredients (except salt and lime juice). Bring to a boil. Reduce heat and simmer for 30 minutes. Set a strainer over a large bowl. Strain cooking liquid into the bowl. Blend in lime juice and salt. Refrigerate for at least 30 minutes before serving to all flavors to marinade. Pour into individual sealable jars to give as gifts, too! I am a llll about the hatch pepper right now! I made enchiladas with them yesterday and this would have been PERFECT with them. Dang it! You’ve an awesome blog here! would you like to create some invite posts on my weblog?